“What a Time” is the sixth song on Michaels’ first part of her first full length studio album, Inner Monologue. The song was part of Michaels’ setlist as the opener of Maroon 5’s 2018 Red Pill Blues Tour, although the song was only part of the setlist for a week. 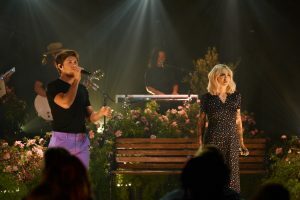 While it was initially performed as a solo song, it was later announced the song was a collaboration with former One Direction singer Niall Horan, whom Michaels opened for at his “Flicker World Tour” in its European leg, in early spring 2018.